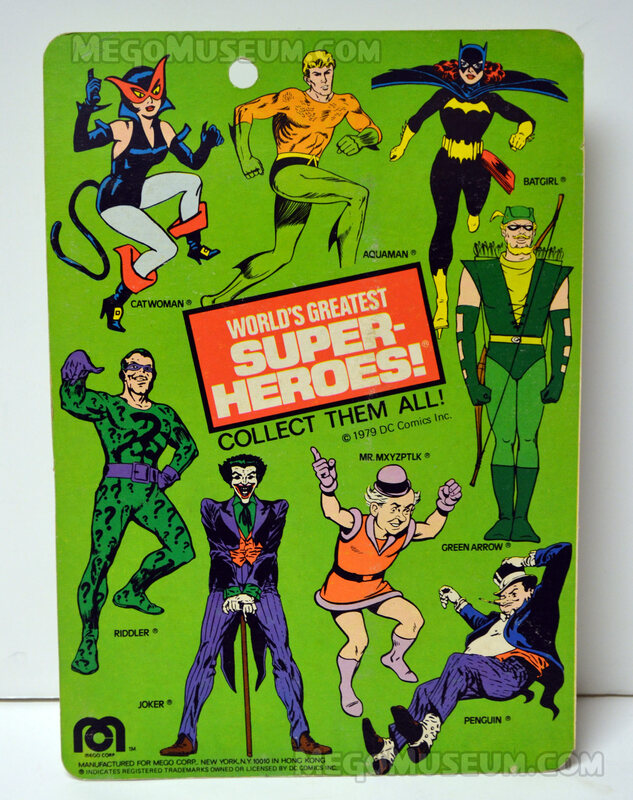 The Super Villains wave was released in their own store counter display box, very few survived. 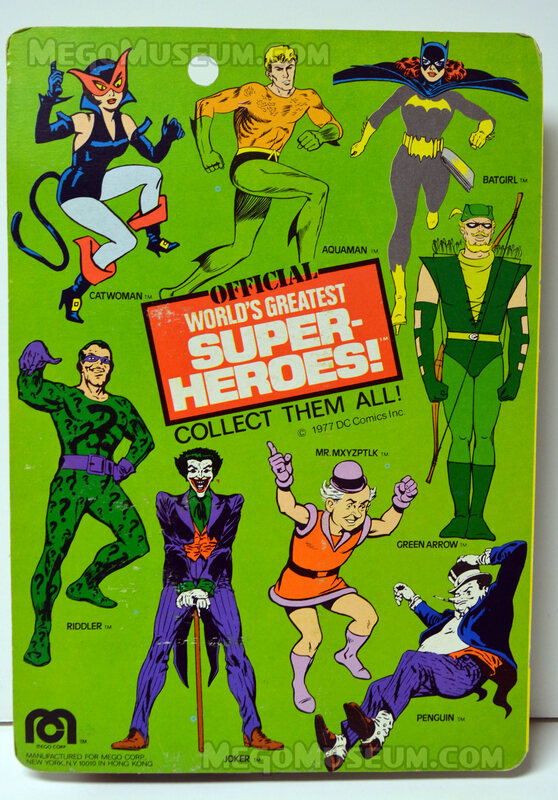 of “Super Foes”, with the exception of one character, all of the Foes were Batman Villains. 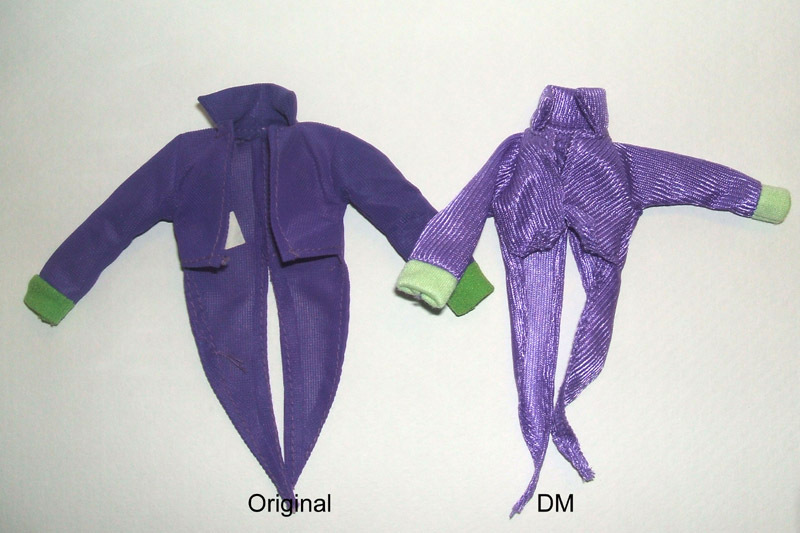 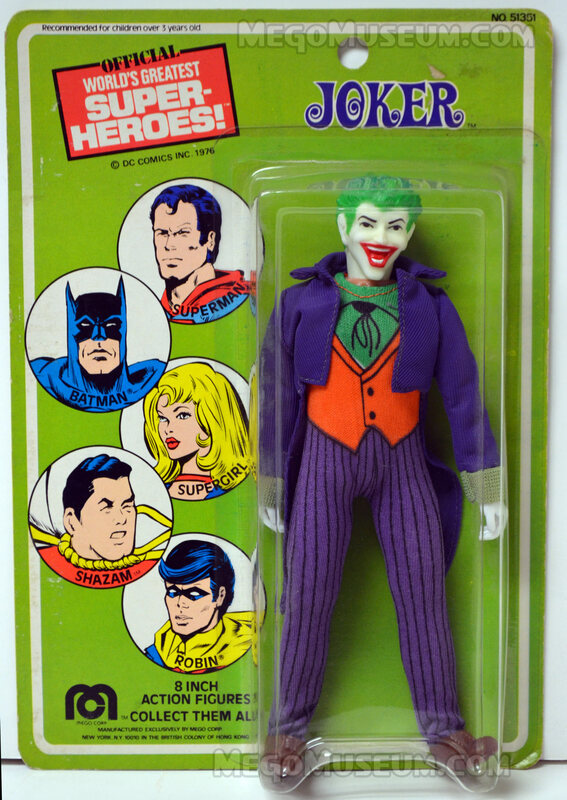 Despite his being in the offering from 1974 to 1981, the Joker is most commonly found on a type 1 body. 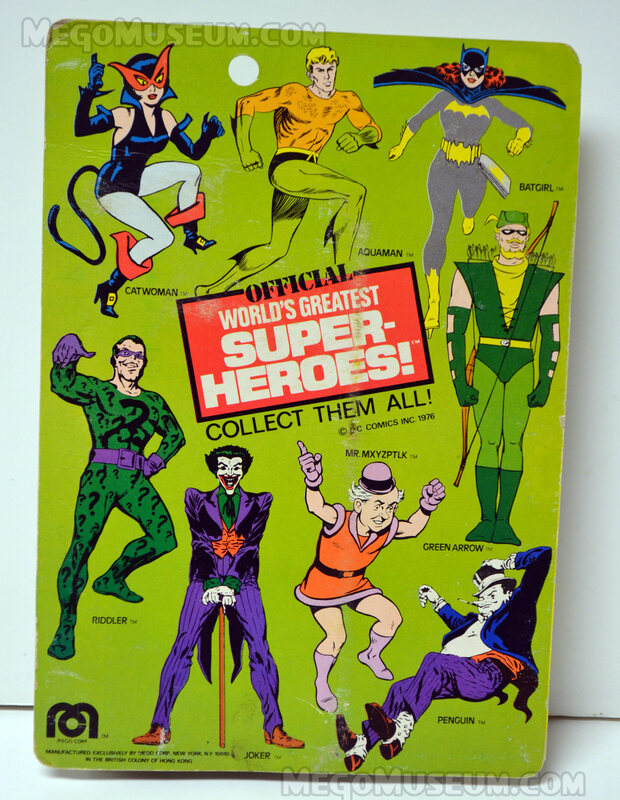 The 1st Issue carded packaging. 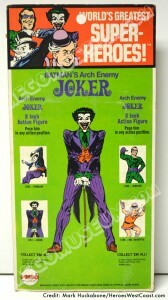 Commonly referred to as a Kresge card, though only a card with a Kresge logo in the bottom center of the card back qualifies. 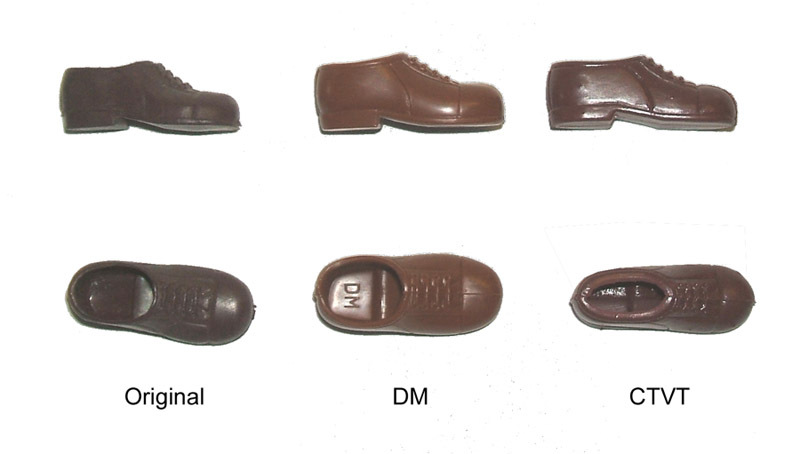 This example does not have a Kresge logo. 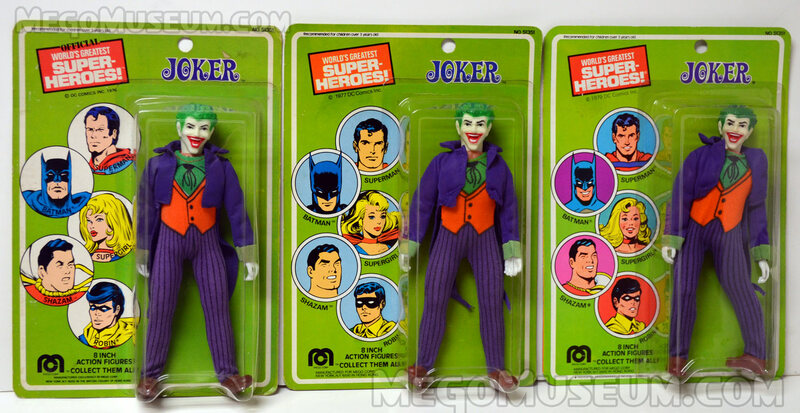 The entire run of US Mego Joker Cards. 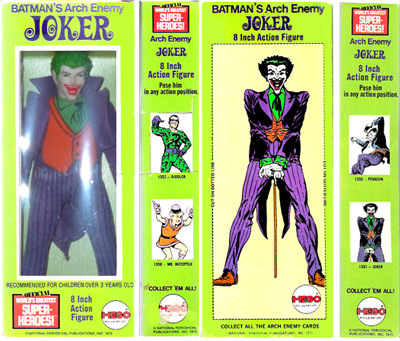 Joker’s US cards show the character’s popularity, from left to right, 1976, 1977 and the 1979 versions of the cards. 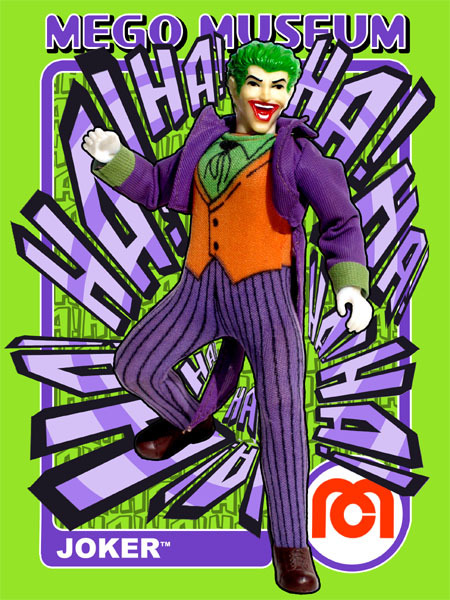 More detailed photos below of each US card. 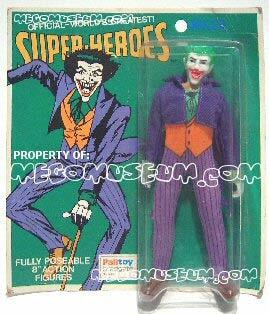 ALL PHOTOS ARE COURTESY OF HEROES ONLINE, CLICK HERE TO VISIT THEIR STORE. 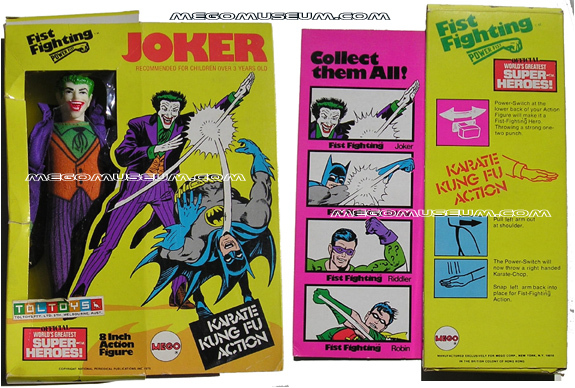 This Boxed Toltoys (Australia) Fist Fighting Joker provided by Raj. 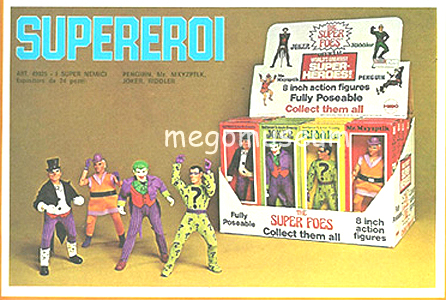 Toltoys often just placed a sticker over US packaging, this was also commonly done in Italy. 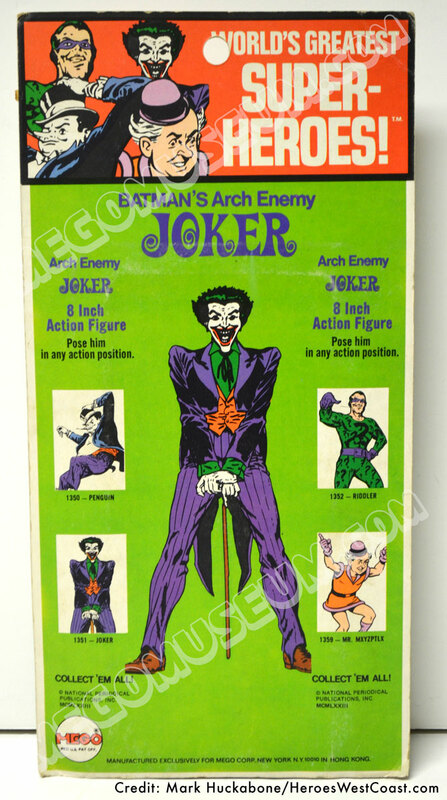 To this date, no evidence has been found for a Lily Ledy Joker, it is not mentioned in any of their sales material nor has anything surfaced in the market. 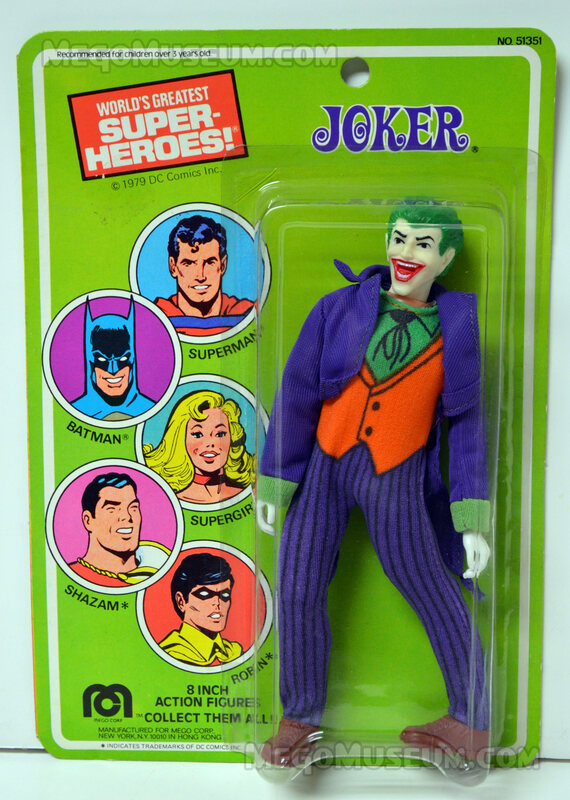 This is puzzling considering Joker’s importance and popularity, and the fact that lesser characters received the Ledy treatment. 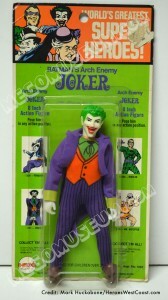 Many still hold out hope that the Joker will be found hiding out South of the US Border. 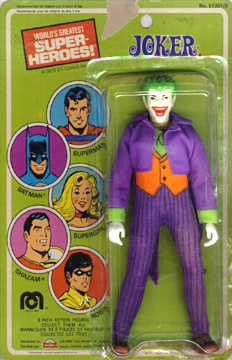 Joker was the only Mego Villain to get his own wheels. 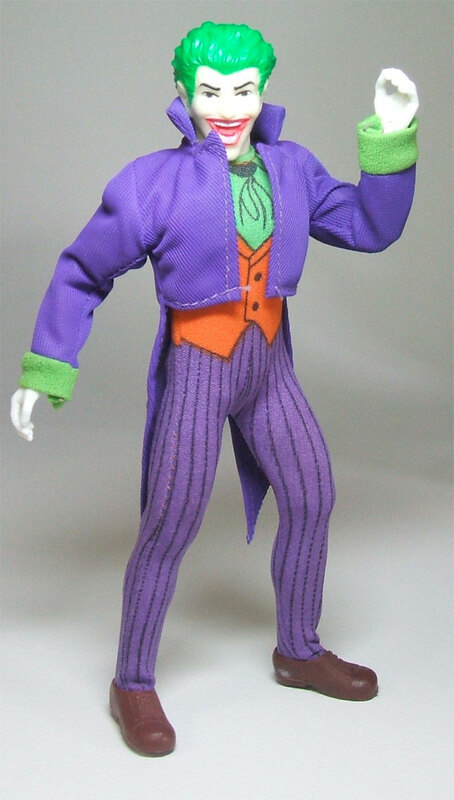 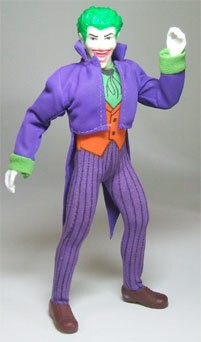 Doctor Mego had a Joker Jacket made. Doc’s is a little smaller than an original, lighter purple with lighter green cuffs, much more shiny textured in appearance. 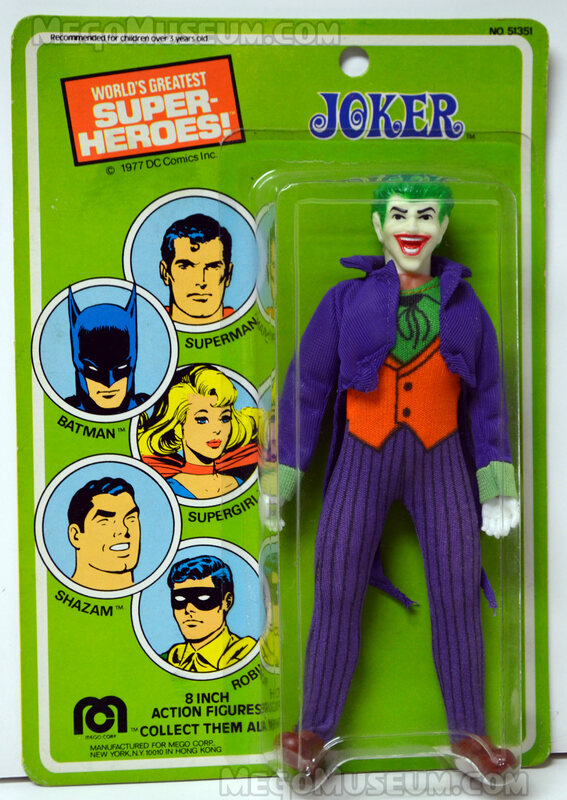 It is unmarked.